After spending the night in the Russian compound detention center, known as Al Moskobia, I was taken to the holding cell in the court to await trail. 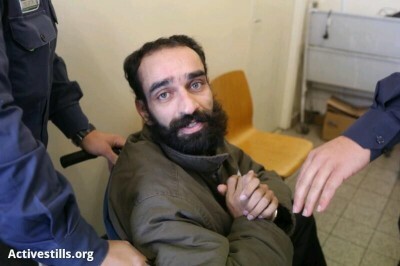 Looking through the bars of the holding cell next to mine I was shocked to recognize Samer Al Issawi. I asked the young man standing near the barred door to tell Samer that I know him and that many others all over the world know his face, his name and his cause and are working to raise awareness and to support him. When Samer heard that I had been arrested in Bab Al Shams he came up to the door to speak to me in person. He was too weak to stand without support and needed to lean himself against the door, but when he spoke he spoke with strength and passion. He sends his regards to all those who took part in Bab al Shams and says that this action has been giving him strength and pride and strengthens his resolve to continue with his hunger strike until his release. “I hope this model will spread and many similar villages will be created around Palestine. I hope to see Bab Al Muhabeh (the gate of love) Bab Al Huriya (the gate of freedom) and Bab Al Salam (the gate of peace).” Samer reiterated his resolve to continue his hunger strike until his release despite his deteriorating condition. “I will join you all on the outside soon,” he said smiling. According to Dr. Daud Abdullah, Samer was Born in December 1979 and is now battling for his life. Long years of imprisonment, deprivation and torment have taken their toll. Still, he continues to resist with the only weapons left available to him; an undaunted spirit and an empty stomach. 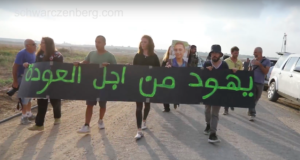 His resolve is never to succumb to what he regards as Israel’s racist policies. 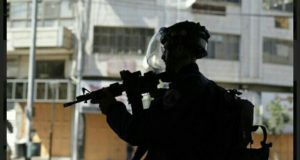 “Shortly after his release in October 2011 as part of the exchange for the release of the Israeli soldier Gilad Shailt, Samer was rearrested; this time the pretext was that he broke the condition of his release by visiting the West Bank. He faces another twenty years behind bars to complete the original sentence. On the 16th January, the day I met him, Samer had a court hearing in Jerusalem in which his appeal was denied. 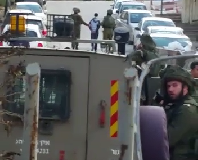 The occupation authorities set another hearing on 5th February at Ofer military court to decide his case.